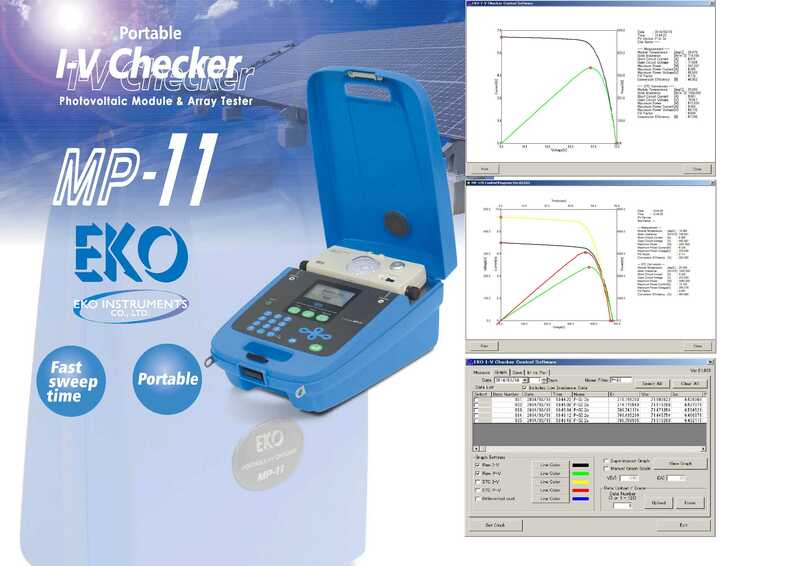 The portable battery operated MP-11 Checkers enable the operator to perform accurate PV performance measurements, known as I-V characteristics of PV modules or arrays on site. For direct control of the measurement functions and viewing the measurement results the Main Unit has a key pad and Graphical LCD display. These IV Checkers offer all in one measurement solution to make PV module testing very easy, hence all required accessories like the radiation sensor, temperature sensors, cables and PC software for control and extended data analysis are included. The MP-11 I-V Checkers are capable to measure I-V curves based on the parameters (Vmax, Imax, Pmax, Voc, Isc, FF, Tmod, ηeff) of any PV module types and arrays, also called strings. They are highly suitable during PV module installation, for making routine checks for inspection of energy yield, tracing module performance and potential defects and general maintenance checks.